Quick double post this week. First up, publishing stuff. Well, it’s turned out that various changes got pushed through during the 4th of July weekend. 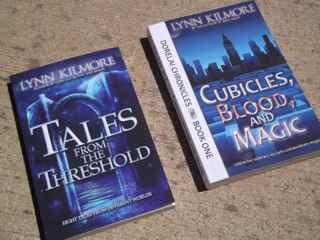 Second editions of A Maze of Cubicles and Tales from the Threshold will begin appearing in e-bookstores later this week. We hope to get JPEGs of the updated covers to post here soon. Also, various short stories that will not be converted over to the Lynn Kilmore name are starting to get pulled down by some vendors now. I’m told it’ll take a few weeks for them to go off sale everywhere, but it has begun this month so that they will be no longer available by September 1st. We’re going to try to get things updated here on the website so that most of the dead links for those short stories get removed. My apologies for any dead links you encounter.